Germany's Max Planck Institute for Gravitational Physics stimulated colliding neutron stars in 2011. The model shows 7.4 milliseconds after the simulated merger. University of Texas Rio Grande Valley physicists, some who’ve worked decades on the project, gathered with faculty and students Monday morning to discuss the discovery in Brownsville. They are among more than 1,000 of Laser Interferometer Gravitational-wave Observatory’s (LIGO) international collaborators. The local event was concurrent with a Washington news conference. 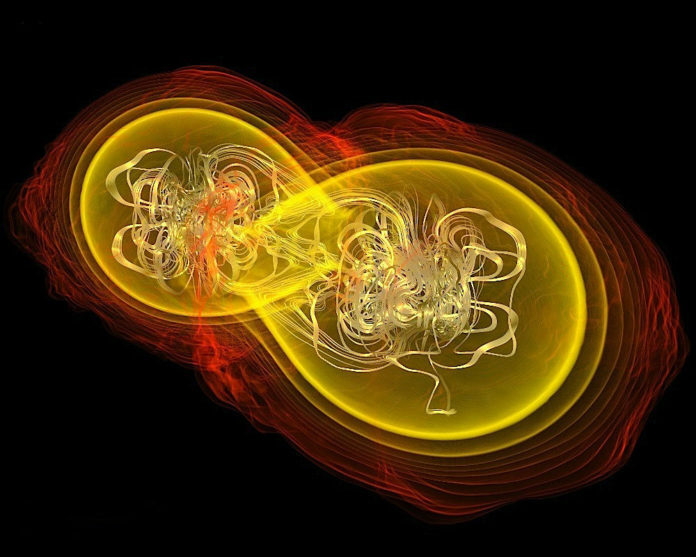 LIGO’s previous detections of gravitational waves, work that won a recent Nobel Prize in Physics, were of colliding black holes. But on Aug. 17, a gravitational wave signal named GW170817 corresponded to an emission of gamma rays detected by NASA’s Fermi space telescope. Neutron stars are city-sized, supertense objects. The two stars, with 1.1 and 1.6 times the mass of our sun, spiraled toward each other before colliding. LIGO’s Livingston and Hanford detectors captured the waves, which are ripples through the fabric of spacetime originally posited by Albert Einstein. Virgo, a third detector in Italy, provided important information to localize the source of the signal, according to the news conference.